Whether you are trying to stop your company from outsourcing or searching for a next project to outsource it doesn’t hurt to know what kind of problems outsourcing can bring upon you and your organization. In other words, what are the disadvantages, cons, negative aspects, etc. of outsourcing? Considering popularity of the question you might expect that there would be plenty of resources on the web to educate you what can (or likely to) go wrong when you outsource any function, project or task. Strangely enough, it’s not the case. Well, maybe it’s not so strange when you look at the sources of the information. First pages of Google and other search engines are taken over by SEO-skilled outsourcing companies that by no means interested in providing you with a full picture. Well, I am not sure that a full picture can be provided anyway – there are unlimited possibilities and variations of negative impact of outsourcing, but the subject surely deserves more than a few easily obstacles that can be easily dealt with. Social responsibility and ethical issues. In IT world discussion of ethical problems of outsourcing usually comes to job loss and income reduction of US-based professionals. There is no questions about it – every job moved offshore is a job lost on-shore, and as long as employers can get quality IT resources for fraction of US salaries, the income of local pros will continue to fall. For past 30 years IT crowd was able to command relatively significant income for labor of significantly less complexity and risk than other high-ed occupations, alas, that feast could not last forever… But that’s not the topic – the question is what are the disadvantages that social responsibility and ethical issues introduce? And the answer is almost none; the world’s most admired and successful companies have been outsourcing left and right with no negative impact on their image (take Apple for example). So the chances are your company won’t be affected by these aspects either. Having said that I have to mention ethical aspects of outsourcing that have a potentially significant negative impact – staff impact, and I’ll touch upon it a bit later. The variety of external risks – risks that do not depend on you or on your organization – is astonishing. Let’s limit our discussion to three groups – geopolitical risks, data security and privacy concerns, and risk of intellectual property loss. The first group present probably the most significant disadvantage of outsourcing: nowadays there is no outsourcing destination which is not akin to proverbial ticking time bomb. No matter where you turn to political instability may cut you off from your supplier bringing otherwise successful engagement to a scratching halt. The cost of mitigating this group of risks could be extremely high dwindling the savings and dwarfing all benefits that outsourcing may promise. The magnitude of this issue is to some degree proportional to the size of the initiative making it negligible for small projects outsourced by organizations with high risk tolerance. Of course some countries are less likely to cut off their support to US-based clients, yet there is no safe heavens. I personally believe that data security and privacy concerns related to outsourcing are exaggerated. I find that many outsourcing vendors do a better job safeguarding their clients’ data than the clients themselves, nevertheless that operational aspect remains to be a disadvantage, due to regulatory constraints. For example, you may lose some, potentially significant percentage of business if you are handling sensitive data offshore. IP loss and offshore outsourcing seem to go like white on rice. How real is the treat, well, I think it goes in waves and my take on it that it’s now on a rise. In particular I would be concerned with business models, and other potentially brilliant pieces of IP that have no significant barrier for entry. Of course source code, IP intensive algorithms, and great but not patentable ideas are equally attractive booty for IP pirates. BTW, IP pirating can come from completely unexpected places most reliable internal resources and including top notch companies (e.g. you might still remember a Microsoft and Plurk outsourcing debacle). The disadvantages of outsourcing in this group are directly related to the capabilities of your own organization. 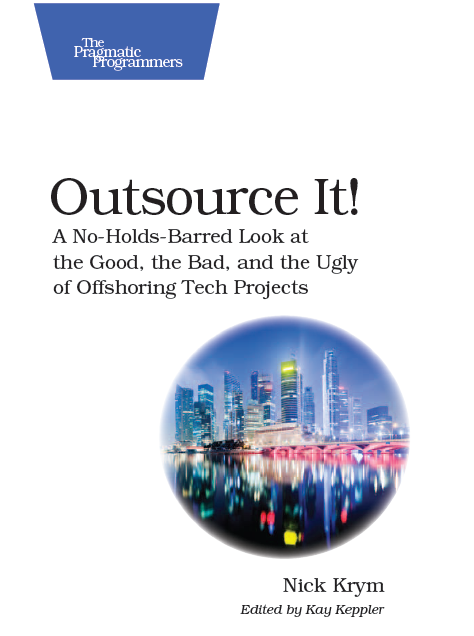 Even though these disadvantages are not directly related to the nature of outsourcing, they are so tightly related to it that they pretty much go hand in hand and include a broad range of issues, with probably most significant being the lack of organizational preparedness. Outsourcing is a powerful tool, it’s also a complex one if used improperly it can backfire and bring more damage than benefit to the user. For example insufficient funds for kicking off an outsourcing initiative most likely put it on a failure track with potentially exceptionally costly ripple effect. Lack of knowledge and skills required for managing and controlling an outsourcing engagement surely results in high total cost of outsourcing, defeating the utter purpose of it. Another internal risk worth discussing is backfiring unrealistic expectations. With much knowledge, a lot of experience and some luck you can save 30 some percent in cost when outsourcing your IT functions, unfortunately that’s not what is typically expected. Unrealistic expectations means usually more than just bruised egos in the end, it means insufficient budgets, deficient backup plans, and substantial loses. One more internal issue that we can touch upon is lack of offshore management skills. These skills are not easy to find and often comes with rather significant price tag. On a top of it any notable size outsourcing initiative needs offshore governance with even more significant price tag. More disadvantages comes of course from the sheer nature of outsourcing – the process of contracting out of a business function, project or task. The first and the most significant item in this group of disadvantages is substantial cost of overhead that is needed to manage remote workforce. That overhead is multidimensional and includes additional time and cost spent on additional documentation and other forms of mitigating the risks of miss-communication, managing differences in processes, organizational culture and so on. That is particular painful on smaller projects when it seems that you can do it faster yourself than explain the task to your partner. One of the inherited issues of contracting out is elevating complexity of operations that is exacerbated by intricacies of communicational channels, cultural differences, geographical disparity, and so on. Communication issues alone can account for significant overhead and substantial financial losses. Another significant negative aspect comes from the realities of offshore outsourcing, in particular the quality of the workforce available for outsourcing. In typical “contract out” situation you would expect that subcontractor is more qualified to perform the operation being hand over to them, e.g. consider building a house where plumbing is done by professional plumbers, electrical circlets are put in by electricians, and so on. Unfortunately, that’s not the case in IT outsourcing where we all too often outsource tasks to resources inferior to those we’d prefer to have in place. The result is lower quality and productivity and inevitable higher costs. Staff turnover is inevitable outcome of outsourcing, in particular in its very beginning. Some portion of it could be related to unavoidable ripple effect of layoffs that typically come along with outsourcing – not too many people are excited to work for the company that outsource its jobs offshore. But that is not necessarily the end of it, as outsourcing sets in more people may elect to seek alternative employers as they see decline in quality of life. Immediate and inevitable corollary of staff turnover is a knowledge loss; you bring offshore resources to replace you C players, but you upset you A players and results are less than encouraging. You hope to retain knowledge with your offshore provider and their internal turnover defeats your plans before the knowledge is even captured. Needless to say the cost of it could be hardly overestimated. And the loss of team spirit – even if the rest of elements of outsourcing stay within manageable boundaries and no risks materialize, losing team spirit alone can significantly reduce the productivity and inflict significant financial pains on your organization. The stats of outsourcing initiatives are far from encouraging, a large percentage of engagements, especially those undertaken for the first time, goes south. If you are someone whose name is associated with the initiative you career might take a serious blow. Another aspect worth mentioning here is your reputation that could take a serious hit along with your career. While it plays both ways – in case of success of the outsourcing engagement both you reputation and career can get a notable boost you need to keep in mind that odds are not in your favor.